Looks like the enterprise android tablet market is growing pretty steadily. The most recent release, the Unitech TB100, offers a really sturdy design and should be a great fit for field service and clumsy employees alike. The TB100 runs Android 3.2 on an NVIDIA Tegra dual core processor with 16 GB of Flash. I think that’s powerful enough to play most apps out there, like the Hulu+ or Mega Jump. You also get plenty of space for things like daily delivery routes, inventory databases, even pictures of cats what look like Ron Swanson. A rear mounted 5 megapixel camera takes great shots for delivery confirmation, or even barcode scanning in a pinch. I’ve mentioned it before, but I definitely recommend picking up a real, actual barcode scanner, like their MS910 or the Moto CS3070 if you’re going to scan more than a few barcodes in a day. It’s just easier. A front mount camera offers 1.2 megapixel shots, great if you need to get your Skype on with the home office. For communications, you can choose between in-the-office or on-the-go versions of the TB100. One model comes with 802.11b/g/n and Bluetooth radios, while the other adds in a 3.75G HSPA+ cellular radio and GPS. It’s great they offer a lower cost version if you don’t need cellular connectivity, like for in-store customer service and inventory management. What really sets the TB100 apart from consumer tablets, and even many of the enterprise tablets hitting the market, is its rugged design. The tablet is environmentally sealed to IP65 specifications. IP65 is a fancy way of saying it’s dust tight and you can tag it with low pressure jets of water and it’ll run fine. I don’t even think I’m IP65, given how pruney I get in water. So now hauling this tablet out into a mild hurricane or rainstorm shouldn’t be a big deal. The TB100 can also operate in temperatures as low as -4 degrees Fahrenheit. So now you have a tablet you can use when selling hot dogs at Lambeau in December, or if you ever feel like watching TV in a deep freeze. And at the hot end of the spectrum, the TB100 runs well in 140 degree temps, so you could sell hot dogs at the Ballpark in Arlington in July if you so desire. I guess you could sell other things than hot dogs, if you’d like. Or play Angry Birds in a blizzard. 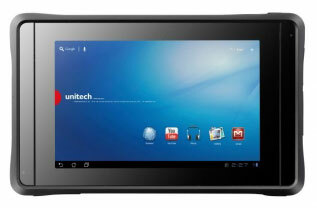 Unitech put the Corning Gorilla glass on the TB100, giving you a sturdier screen than if they used pigmy marmoset glass. It also helps protect the tablet from four-foot drops to plywood. So I wouldn’t necessarily chuck this off a truck, but if a retail employee suffers from butterfingers they should be okay. In all, this should be a good solution for businesses dealing in harsh environments but not needing a fully hardened tablet. It could be great for construction applications, allowing foremen to manage blueprints and purchase orders on the go. You also get a great device for mobile POS in extreme temperatures, like food vending in hot climates.